Does this sound farfetched or like a gloom & doom forecast? Well, twelve months ago, so was the prospect of Donald J. Trump becoming the Republican Party’s nominee this year for the November, 2016 presidential election. And this was against sixteen opponents who were all qualified and persons of character and integrity. A Trump administration may bring us to the brink of war – consider his comments about North Korea, China, Japan, Russia and Mexico. With no foreign or diplomatic experience, how will he act when his questionable negotiating skills are met with challenges by the leaders of other nations? Will he walk out, leaving the U.S. vulnerable? Will he attempt to “fire” those he disagrees with or doesn’t like their appearance? There is no greater combination of traits than arrogance and ignorance to derail life as we know it. This is no longer a matter of light banter or water-cooler chatter. It is time to get serious, especially with just three months before the election. Trump is a dangerous man who happened to bully and belittle his way to his party’s nomination. He must be stopped. If you agree with what we say here, talk with your friends and parents about how you can participate in this important election. If you’re under 18 and can’t vote, this is still about your future and there are many ways for you to pitch in. If you want to learn more about the subjects discussed here, google “Trump on . . . ” and add the issue. Photo of Captain Humayun Khan via Heavy.com. 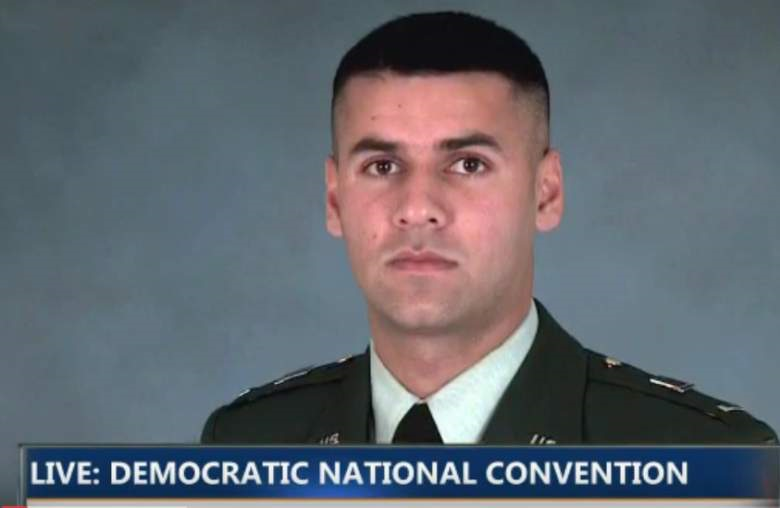 Captain Khan died in the Iraq war while saving his fellow soldiers.